When you're off gallivanting around in some far off land, it's easy to let its exotic wonders tempt you into overspending, forcing you to potentially miss out on your last couple days in Anaheim. Don't be that guy: Budget Your Trip. Locally-based BYT's an easy to use e-source that helps you plan fiscally responsible trips not only by comparing what you budgeted for travel vs. your actual expenses, but also by displaying other travelers' after-the-fact trip data to give an idea of how much stuff actually costs in different parts of the world, so you can finally find out if you're the king of the Cambodian Sexcapade on a Shoestring (SPOILER ALERT: You are the King of the Cambodian Sexcapade on a Shoestring). Create a budget by keying in how much you think you'll spend on everything -- from accommodation, to transportation, to alcohol -- in each destination on your itinerary (they'll show you USD and foreign currency); when you're done, it populates a full list of what you plan to spend where (which you can filter by location/date/etc. ), and a budgetary pie chart, complete with percentages and dollar amounts, which breaks down your proposed expenses by category, so you can see exactly how much you're spending on pie. 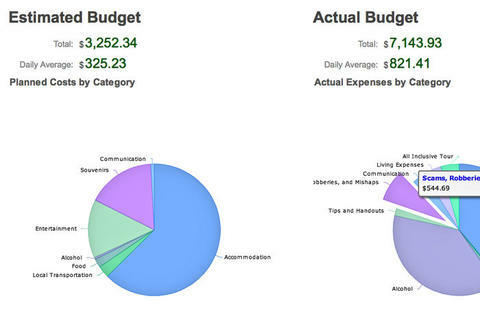 When you're on the road, enter your actual expenses (in all previous categories, plus unforeseen action like scams and robberies), and that'll populate another pie chart for side-by-side viewing, plus give you a graph showing you how much your day-to-day spending fluxuates, as well as a simple chart of average daily expenses also broken down by location, proving to your kidnappers that, really, all you've got left is that remaining kidney. A good way to see BYT in action and inform your own trip's to peep its creators' voyage "Round The World", where chart after chart and graph after graph meticulously illustrates responsible travel in places as disparate as Estonia and Kenya -- an exotic, far away land where the monkeys are inexplicably not into rallies.